An orbital fracture is usually associated with acute eye injuries or injuries to nearby structures, such as the eyelids, the lacrimal apparatus, or the canthi. Immediate signs of orbital injury include restriction of eye movements, sucking in of the eye, orbital bony injury, and damage to the eye itself or its nerves. Delayed complication of this injury includes bony remodeling, secondary abscess formation, external fertilization from a retained foreign body, bony blood cysts and fistulas between the carotid artery and cavernous sinuses. Aneurysms and AV malformations can also be long-term complications of an orbital fracture. Here's everything you need to know about orbital fractures, including diagnosis, management, and treatment. After making sure the globe has not been ruptured and assessing the status of the optic nerve, the examiner should step back and evaluate the symmetry of the position of the eyes. The globe may be displaced inferiorly when compared to the unaffected eye or it can be axially malpositioned in the affected eye during an orbital fracture. The eye can temporarily stick out because of swelling and hemorrhage of the soft tissue. There can also be rare instances of defects of the orbital roof, with herniation of the anterior brain contents and the eye. The opposite scenario, where the eye is sucked in is more common and is due to orbital fractures (especially of the medial or lower aspect of the orbital cavity). Herniation of the orbital contents through the fracture or development of cicatricial changes in the soft tissues of the eye can also contribute to the eye sucking inward, a phenomenon called enophthalmos. It is usually easy to see the asymmetry of the position of the globe with respect to the other eye. This should be documented and quantified for future comparisons of the eye. The examiner needs to stand above the patient’s head, hold open eye eyelids, and look down at the apices of the corneas. The presence of axial displacement (sticking in or out of the eye) is usually readily apparent. Globe malposition may not develop, even in the presence of major fractures if the normal suspensory ligamentous sling of the eye is still intact. If the supporting structures of the globe are, however, disrupted, the globe may develop inferior displacement so that the eye is lower than the normal eye. Orbital floor or large rim fractures can result in unilateral exophthalmos. Extensive fractures of the of the maxilla tend to cause problems visible in both eyes. Palpation of the orbital rim is an easy way to see if the orbital ridges are intact. A fracture of the orbital rim involves more forceful trauma than is seen in a medial wall or orbital floor fractures. Orbital rim palpation allows the examiner to detect subtle step-offs of the rim, especially of localized soft tissue swelling has obscured visually seeing the fracture. Orbital rim fractures are frequently localized at bony suture lines. For example, fractures of the inferior rim tend to occur along the zygomaticomaxillary suture. These are often seen as having the classic step-off deformity, in which there is a definite misalignment of the fractured bones that is readily palpable. Similarly, lateral orbital fractures usually align themselves along the frontozygomatic suture line. Crushing zygomatic, trimalleolar, or tripod fractures involve both the medial and lateral rims of the eye along with the zygomatic arch. Evaluation through a touch of the superior and nasal aspects of the orbital rim is also useful in detecting orbital rim fractures. Diagnosis of superior rim fracture is especially important because they are often associated with orbital roof fractures as well. In such cases, the potential for brain injury is high and this should take priority over the orbital fracture. Palpation of the medial rim is rarely necessary because these injuries are usually readily visible. Clinical suspicion of medial rim fractures is usually aroused whenever there is a direct hit to the nose or the medial rim itself. Multiple fractures of the ethmoid sinuses are also often seen in these types of fractures. The expansion of the distance between the medial canthus and the lateral canthus (the corners of the eyes) is called “telecanthus”. The change in the intercanthal distance is sometimes seen in midface fractures. In such cases, there is often disruption of the normal nasal bone anatomy and possible rupturing of the medial canthal tendon. It more often appears in cases of unilateral eye injury and less apparent when both eyes have been damaged. 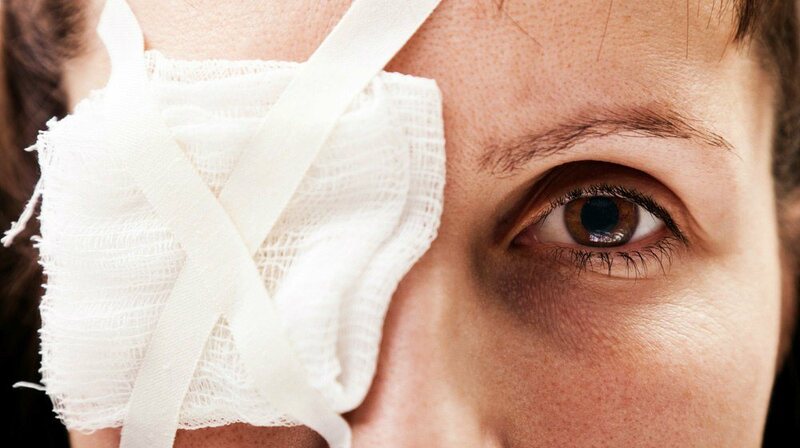 This system is frequently disrupted in patients with orbital or naso-orbital trauma because of its close approximation to the middle corner of the eye. There is about a 20 percent incidence in lacerations of the nasolacrimal duct when the patient has had a nasoethmoidal fracture. Evaluation and repair of this system are usually delayed until the soft tissue swelling has gone down, except for the immediate repair necessary for the canalicular system. Usually, the lacrimal system needs to be repaired before the telecanthus. Since the floor of the orbit serves as the canal that carries the infraorbital nerve, it is not unusual to find numbness along the distribution of this nerve and its three branches in patients with orbital floor fractures. This is a division of the trigeminal nerve and is usually sensory in nature, transmitting sensation from the skin and conjunctiva of the lower lid, the skin and subcutaneous tissues of the side of the nose, and the skin and mucous membranes of the gingiva, upper lip, and labial glands. If there is numbness in these areas, it is suspected that a fracture has occurred and the infraorbital nerve has been damaged. Palpable air in the periorbital tissues, known as orbital emphysema, is a clear sign of an orbital fracture because this means that the fracture includes one of the air-filled sinuses around the eye. This is usually seen with medial orbital fractures because of its connection to the ethmoid sinuses in the nose. The presence of air in the periorbital tissues can be simply palpated or it can show up in x-ray studies. The eye should also be evaluated in all of its fields of gaze. Posttraumatic limitation of movement is not an unusual phenomenon so it is not definite that it comes from entrapment of one of the extraocular muscles. Posttraumatic limitation of ocular motility or lid elevation can result from any number of circumstances, including a direct injury to one of the muscles or the nerves leading to movement of the muscles, mechanical restriction of the muscles due to an orbital bony fracture or to central nervous system problems, such as increased intracranial pressure or palsy of the sixth cranial nerve. Surgery may be necessary if there is significant sucking in of the eye or true mechanical restriction of the eye movement. Horizontal and vertical limitations usually develop as a result of hemorrhage, swelling or problems with the nerves and muscles themselves. Patients with this type of diffuse motility limitations often heal themselves spontaneously as the bleeding and swelling resolve. The same is true of any patient with purely horizontal restrictions, especially abduction restrictions as these are usually the result of increased intracranial pressure. Patients, on the other hand, who have relatively pure limitations are most likely to have true entrapment of their extraocular muscles. Entrapment can involve the inferior rectus muscle, the tissues around the muscle, or inferior oblique muscle. Pure limitation of upward gaze without limitation of downward gaze is typically associated with true mechanical restriction of the muscles or other tissues. An entrapped inferior rectus muscle will be tethered so that any attempted movement of the globe in either direction of the vertical plane will be impossible. Small orbital fractures are more likely to cause entrapment from a trap door effect with the incarceration of the prolapsed tissues and are less likely to cause sucking in of the eye due to the expansion of the orbital volume. The opposite is true of large fractures of the orbital floor. Pupillary reactivity is an important aspect of the eye examination. It is especially important after trauma to the eye because it gives the examiner important information about the status of the eye and the function of the optic nerve. Lack of reactivity to light, irregularity of the pupil’s shape, or pupillary malposition may indicate damage to the iris sphincter muscle. A normal appearing iris that is relatively nonreactive may indicate damage to the parasympathetic fibers of the eye as can be seen in the orbital apex, third nerve palsy or damage to the ciliary ganglion. There are several ways to evaluate a bony fracture of the orbit. Conventional x-rays, however, remain the imaging method of choice, at least in the beginning of the evaluation. CT scanning can also be done along with MRI scanning, which picks up soft tissue more readily than x-ray or CT scanning. Plain x-rays are especially helpful when a bony injury is suspected. Bony fractures are usually seen as having air in the brain cavity or in the orbital cavity. Special views can be taken, such as lateral views, Waters views or Caldwell views to screen for the presence of the traumatized eye. These views can also be done to evaluate the maxillary sinus, the frontal sinuses, the orbital roof, and the lacrimal fossa. Excellent viewing of the bones and soft tissue can be performed by using a CT scan or an MRI scan of the affected eye. They have the advantage of being able to see the brain as well. The dye can be injected into the puncta of the eye to visualize any anomalies that might be present in the lacrimal drainage system. The possibility of optic nerve injury with orbital apex fractures in the absence of signs and symptoms optic nerve compression makes CT scanning of these types of fractures especially important. Traumatic optic nerve compression usually comes from hemorrhaging of the eye structures, displaced bony fragments, or inflammation of the optic nerve. There can be compression on the optic nerve from a bony callus after the fracture heals. Ultrasound is very helpful in evaluating and localizing intraocular foreign bodies but it Is very limited in evaluating foreign bodies of the outside of the eye and in the orbital cavity instead. CT scanning is considered a better test for finding foreign bodies. Steel and copper foreign bodies can be detected if they are as small as 0.06 cubic millimeters. Glass cannot be detected as easily and wooden foreign bodies are particularly hard to see. There is controversy regarding the necessity and timing of surgical repair of the orbital fracture. For blowout fractures, the surgery is necessary if there is double vision, mobility limitations of the eye, sinking in of the eye, and x-ray evidence of a blowout fracture. Minor clinical symptoms, such as numbness of the inferior part of the eye is also an indication for surgery. A simple blowout fracture is not an indication for surgical repair. Instead, you need to have the findings of motility disturbance from entrapment of the muscles, sucking in of the eye, and hydrophthalmos. Most people don’t like the look of having their eye sucked in and choose to have surgery for cosmetic reasons. The timing of surgery depends on the presence of associated injuries, the degree of impairment, and the patient’s age, general health, and preference. Blow out fracture surgery should not be approached in a cavalier manner because there are many complications to having this surgery, including numbness around the eye, extrusion of the implant, double vision, and blindness. Surgical intervention is best easier to do and may have a better result with surgery done within the first ten days after the injury, giving time for soft tissue swelling to go down and for hemorrhaging to be controlled. A short course of steroid therapy may be helpful to determine whether the symptoms are related to swelling of the nerves and muscles, or to true entrapment of the nerves. It also tends to speed up the healing of double vision and reduces patient discomfort and disability of the eye. This can increase the risks of peri-orbital infections so it must be given with caution. Do you have anything else to add to our discussion about orbital fracture? Tell us in the comments section below!